My work has been grounded in systems thinking. That has been the intellectual field that has informed my inquiry and has justified my natural tendency for connecting seemingly unrelated things and expanded boundaries. The field that has supported my personal quest for greater integration and inclusivity. However, although I continue to do much of my work in academic environments, I’m finding the need—and the desire—to explore other ways of knowing that academia has not been too eager to embrace. We have overemphasized our intellectual abilities. But I believe that at this point in time, with the urgent and complex challenges at the local and global levels, we cannot rely only on our brains. There is a call to include the heart. Not only the heart, but also the hands and the whole body. It is time for moving beyond systems thinking and to learn to be truly systemic. We have learned much from “living systems”—those complex, adaptive, evolving natural systems that span from cells to galaxies. So it is time to learn how to live those systems, how to be those systems, how to feel those systems, and how to evolve with those systems. So I’m in experimentation mode. And I took a risk with my students. The inspiration came from my recent experience at Wasan Island, in Ontario, Canada, where the group dialogue and collaborative exploration went beyond transformative learning to collective healing. The role of creative expression was crucial in this experience. Music, movement, poetry and painting in a beautiful-beyond-words natural environment created a safe space for our full humanity to show up. The fact that this experience happened in an island was intriguing: is it so that powerful experiences, like these, are meant to be in remote places as once-in-a-lifetime events? I hope not. In fact, I had a beautiful vision: this island—and I have heard since then that many islands around the planet—are sacred places where we are able to experience the possible human (a glimpse of our future). So my exploration was about how to re-create those elements that could create the conditions for deep connections; openness and vulnerability; authenticity and joy. I think that those are good ingredients for the kind of learning we need to do. 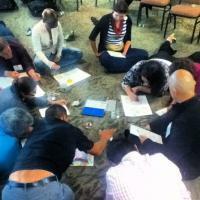 At the last Saybrook residential conference (or RC), I offered a one day workshop. I remember having a clear intention for what I wanted to do, but I was not completely clear on how to do it. My current learning is about listening deeply to what wants to emerge. I’m too used to coming up with a clear design in my mind and simply implement it. But what if there is something else that could happen in the space of my workshop if I allow it to show up? I had to submit a description for the workshop a few months before the conference. So I did. The title that I chose was “A Systems View of the World Revisited: Thinking, Emotions and Intuition to Transform Your Self and the World.” It seemed to capture (in words) my intention and it played on the concept of the “systems view,” which my mentors Ervin Laszlo and Bela H. Banathy were so instrumental in disseminating. I’m standing on their shoulders and seeking to honor their contribution. Once the final schedule of the RC was completed, I learned that my workshop would run parallel with another seminar that was a requirement for a lot of my organizational systems (or OS) students. Darn. But I was happily surprised with a fairly large group that included students not only from the OS program, but also psychology and human science. That morning, during breakfast, I finalized the flow of learning activities for the day. I wouldn’t call it improvisation unless we redefine the term. For me, it is practicing how to allow something to happen through me rather than making something happen. Of course, I was about to try to create a sacred space in the most profane environment (a hotel conference room). I couldn’t bring the pristine and enchanting nature of Wasan Island. But what I could bring was a slightly wider range of the human experience. After welcoming the group, my first announcement was that there was no power point presentation for the day – something quite revolutionary in a graduate seminar. Before we went around the circle to introduce ourselves, I facilitated a movement exercise that helped each individual to focus on themselves, then on the spaces between them, and then on each other, ending the movement (and silent) exercise with looking into the eyes of every single individual in the group. So before we talked to each other, we already felt empathically connected. The day progressed with rich dialogues to reflect on the experiences, make connections to our personal and professional journeys, and playing to put in practice some of the concepts we were exploring to real organizational or community cases offered by students. We were practicing collective intelligence. After lunch, I told the group that it was OK if anyone preferred not to participate in the afternoon session of the workshop. They had permission to leave or to only observe. I took out water crayons and gave them paper to draw. They had to do it on the floor sharing the crayons and using their fingers to smear the color with water. I asked them to paint two pictures. The first was free painting to express themselves in whatever way it was meaningful to them after the morning experience. The other painting had specific instructions—it was a shamanic exercise from the Maori medicine men of New Zealand that uses symbols to create a picture as a divination tool. This group of Ph.D. students looked like kindergarteners playing together. They even had to clean up after they finished their paintings. And, even though in OS we can be quite inclusive of emotional and even spiritual perspectives to inform our work as scholar-practitioners, I wasn’t sure if the archetypal nature of the Maori exercise was going to resonate with them. But it did. In fact, they found it deeply informative of themselves and their life path. We closed the day with a circle of appreciation. It was hard to contain my tears of joy for the beautiful experience that we co-created that day. The feedback that I received a few weeks later was interesting. In the Wasan Island experience, it was very clear that we said “yes” to an ambiguous invitation because we trusted the individuals who invited us. I think that the same happened in this RC seminar. Nobody remember the title of the workshop (not even me!) but they simply described it as “Kathia’s workshop.” Almost nobody understood what the day was going to be about from what they read in the conference program description—another indication that they trusted me. But 100 percent of the students who provided feedback expressed that the experience went beyond their expectations and that it was highly valuable. Phew! This seminar was a baby step for me. A step in my own journey to listen to my calling and to do the work that I’m called to do. The experience gave me confidence that there is interest, maybe even readiness, to start working from this place of not-knowing or of knowing differently. I am so grateful for my students and for the institutional context that Saybrook provides for this kind of work. This kind of learning is possible in very few places. Saybrook is still one of those special places.